. : The Gatineau Park Trails: An advanced user's guide :: Ski XCOttawa.ca :: Skiing in Ottawa and Gatineau Park :. Ottawa and Gatineau have got some great trails and places to train. However, if you live here long enough, things can get boring. To solve this problem for some of you, I've decided to write an article about some of my favourite, and lesser known, places to train in this area.S ome of these you will know, but hopefully I'll talk about some place you haven't been, and you'll check it out, and your life will be better because of it. Obvious one here. All the parkways are closed every Sunday until 12 pm, the North Loop and the section from P8 to Micah are closed 8-11 am on Saturdays, and the North Loop is also closed Tuesdays and Thursdays 6 – 8 pm. These are great for rollerski training during these times, but they also get boring quickly, so where else can we go? In my opinion, the immense network of Bike Paths in Ottawa is severely underused for rollerskiing. There are a ton of them. I've listed below a few of my favourite loops to do around here. Click here for a full map. One of my favourite loops. Lots of hills and variety, takes about 2 h to do. A nice loop following the Ottawa river upstream to the Aylmer Marina, then back through Aylmer. The loop used to have very bad pavement, but has recently been completely repaved. This loop can also be combined with the Hull loop to make a nice 3.5 h rollerski loop. At Carleton or Ottawa University and want to go for a rollerski? This one is perfect. Takes about 2 h to do, follows the Ottawa river up, then back through various parks and green areas in Ottawa, finally coming back through the experimental farm. There are a lot of trails in the Gatineau Park. I can't but scratch the surface, but here are some of my favourites, and some you may not have known about. 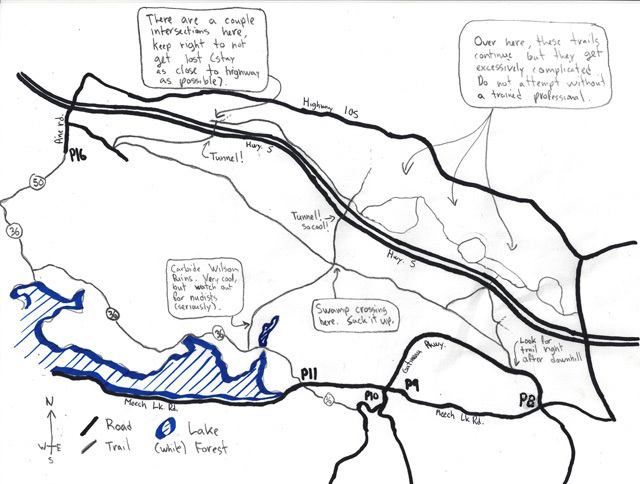 I've provided smaller maps for some of these, otherwise consult the Gatineau Park trail map, here. This is a nice 1.5 h loop that starts from Blanchet beach. Follow trail 62 up from P13, cross trail one, and loop around back to P13. 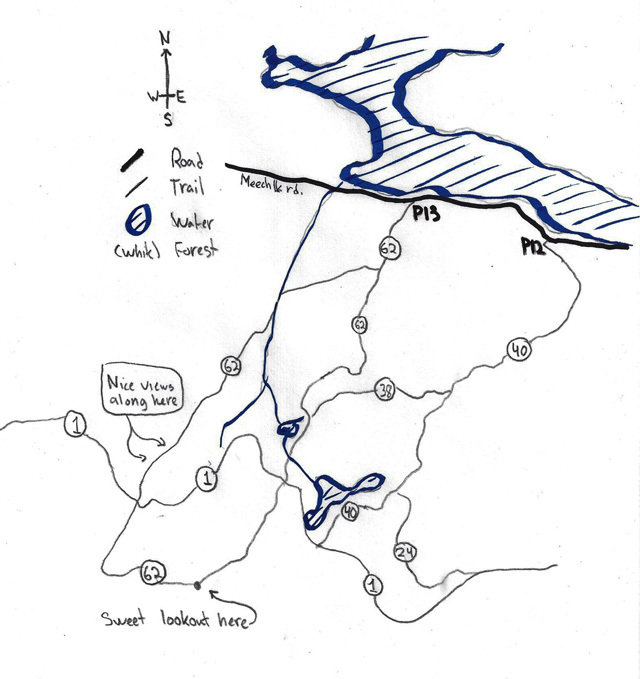 As a variation, you can start from P12, head up trail 40, and then cross over to trail 62 on trail 38. Was unsure what to call these. I doubt many of you have been on these ones, but they are my favourite place in the park to train. It helps that I can access them within 5 minutes from my house. These trails open so many interesting loops. They connect popular places like P8, O'Brien Beach, and even P16. One loop you can do is to start at P8, head out and cross the highway at the first tunnel, head to the second tunnel, cross back, go to P16 and then follow the trails all the way back to P8. Another cool loop is to start at O'Brien Beach, head along trail 36 to trail 50, and then to P16. You can then follow these trails all the way back to Carbide Wilson Ruins, then back to O'Brien. Lastly, you can start at P8, make your way to P11 by going up to Skyline, then onto trail 22 into Camp Fortune. From there you can take trail 36 all the way down to P11, O'Brien. Then you can take the trail to Carbide Wilson Ruins, continue to the intersection, turn right and head back to P8 on these trails. I don't have a map for these, so you'll have to look on the trail map (link here). Basically, any time you take trail 1 to get somewhere, you can take these trails instead, and they are much more interesting. Trail 22 and 33 both leave from the west side of Skyline, weave around the woods, and come out on trail 4. From there you can go into Camp Fortune area, or connect to other interesting trails like #17 or #8. On the south side of Trail 1, these trails also wind through the park in interesting ways. Great places for a run. 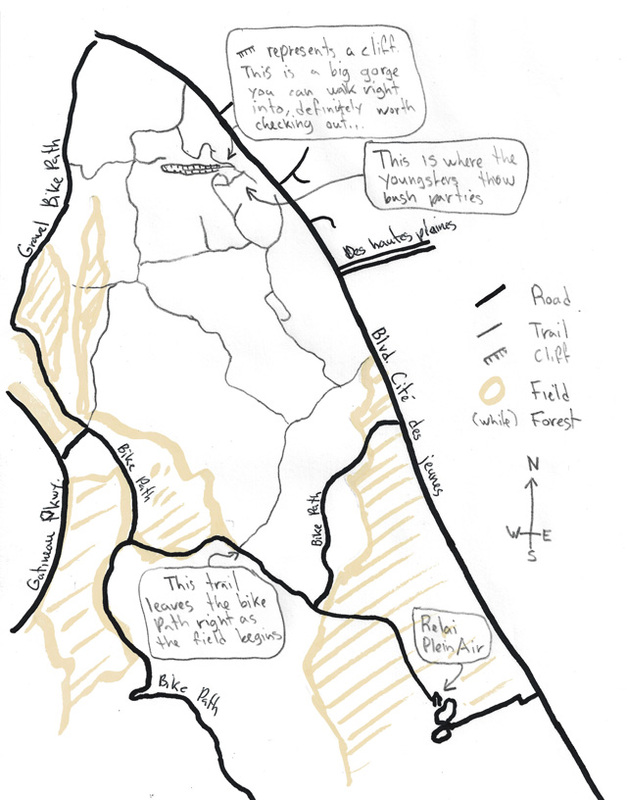 You can even hook onto trail #11, and rejoin up with trail #22 or #33, mentioned earlier. There are a few more trails than are listed on the official maps around Cité des Jeunes area. If you live in this area, you should definitely take advantage of these trails. Map created with the help of Ottawa Orienteering Club. If you like maps or orienteering, check them out. They organize really amazing orienteering meets in the spring and fall. See their website here, or check out an article my teammate Riel Allain wrote about orienteering earlier this year. There are a number of loops you can do here. One particularly cool spot is a gorge you can walk right into, surrounded by cliffs about 10-15 metres tall. It's gorgeous. See the top of the map. There are many places to ride around Gatineau – too many to list. But here are my favourites (besides the obvious parkway loop ride). Awesome loop, not many cars and a few pretty crazy downhills. Definitely one of the best rides around here. I hope this has helped some of you find some new and fun places to train. Hopefully I'll see you out on the trails!